Many of us have a habit of trying out new freeware and trial applications on our PC. This normally includes the common process of installing and uninstalling. However, you need to make a note that there are many applications which do not delete the related registry keys properly from the PC even after you uninstall them. As a result, your system registry gets messed up with too many junk keys which in turn affect the speed and performance of your PC. It is also not possible for you to clean the system registry to get rid of these junk keys as it is very difficult to identify these unwanted registry keys. However, there is a tool named “WhatChanged” that enables you to identify the registry keys that have been freshly added to your PC after you have installed an application. 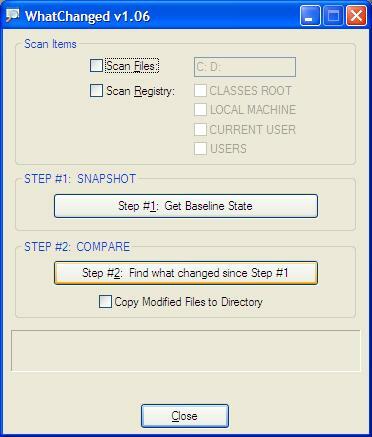 WhatChanged efficiently scans and identifies the new keys that are added to the system registry. Using this tool is quite simple. You need to perform just two easy steps. Firstly, you have to choose the items (i.e. the files/ registry or both) that you wish to trace and then click on the button “Step #1” in order to obtain the snapshot of files and registry as The multidisciplinary epilepsy team at The Mirken Department of Neurology provides comprehensive epilepsy care with sophisticated diagnostic methods, the la driving training school medical and surgical treatments, and practical support and guidance for both patients and their families. a baseline before the changes are made. An output file containing the items that have been captured will be created at the same location where you have saved the WhatChanged tool. Secondly, click on the button “Step#2” to check what has changed in the registry since step #1. It will now compare the snapshots, the one before change and the one after change. WhatChanged will generate the comparison results within a text file which will be placed at the same location where you have saved the WhatChanged tool. By looking at the text file containing the results, you will easily know what all has been added to the system registry of your PC after the installation of the application. Now, even after uninstalling the application if you see that some related registry keys still exist in the system registry, you can manually delete them as you are sure that they are no more necessary. WhatChanged 1.06 is a tiny utility that consumes only 92 KB of disk space. Moreover, it is just an executable file and hence you do not need to spend time in installing it. You just need to run the exe file to launch the utility and start using it immediately. It works well with Windows Vista and Windows XP.